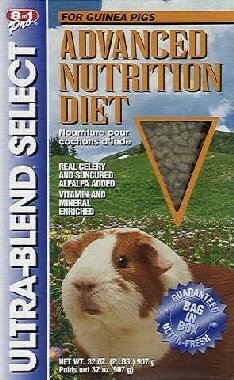 Before I go into the types of cavy food, I advice you not to buy in bulk unless you have lots of cavies. The bag of pellets should not last more than 2 months. If it does, not only will it be less fresh but you run the risk of it turning mouldy too. I experienced this when I bought two 5 lb bags of pellets. The first bag was fine but the second wasn't. The darn pellets had become damp & were "fused" together in 1 solid lump. They eventually turned mouldy. Fortunately I saw it in time & dumped them. Cavy feed can be grouped under 2 main groups: pellets & mixes. Pellets as the name suggests are nothing but pellets. Mixes on the other hand usually contain many ingredients like pellets, corn flakes, seeds, nuts, dehydrated vegetables, etc. Mixes are regarded by many people to be a bad choice. This is because they are high in fat & the nuts could be choking hazards especially if they're un-hulled. Mixes usually also contain artificial colours & due to the presence of high fat ingredients like nuts, preservatives are required. I strongly recommend using pellets because they are healthier than mixes. Of course there are different brands & some are better than others. Oxbow is the best although a bit more costly. There are some things you should take note of before deciding on the brand of pellets. "You would not feed an adult dog or cat a puppy or kitten food, so why do we feed guinea pigs the same diet their whole life? The answer may be that it is not economically feasible for a large pet food company to manufacture a special maintenance diet for small animals." "The higher levels of proteins, carbohydrates, and calcium found in most guinea pig feeds on the market are not healthy for the adult pig, leading to obesity and possible shortening of the life span." "Undiagnosed ileus (blockages of the digestive tract due to gut slowdown problems) is commonly seen in guinea pigs on low fiber diets. Many times pet owners do not notice the signs associated with gastrointestinal slowdown until it is too late and the animal has died. Diets that incorporate high levels of indigestible fiber, in the form of hay, promote increased gut motility and thereby prevent this gut slowdown." "Obesity in guinea pigs can lead to other health problems such as heart and liver disease. Typical guinea pig feeds on the market contain high levels of fat, commonly over 3% and as high as 5%. These feeds contain corn, oats and other grains that are designed to appeal to the consumer, but also raise the starch and energy content. When fed free choice, obesity can occur, which not only leads to the previously mentioned health problems, but can also prevent coprography, which is necessary to maintain a healthy microbial population in the hindgut." "Enteritis, intestinal inflammation associated with toxin production, is a problem commonly associated with diets that contain high levels of energy (starch and glucose). A low fiber, high starch diet promotes gut hypomotility and changes the intestinal environmental pH which allows pathogens (bad bacteria) to produce toxins that can kill a guinea pig. Feeds high in grains contain high levels of carbohydrates which are digested in the cecum and can lead to Enteritis." "Urolithiasis (bladder stones) is being seen in more and more guinea pigs and although many are secondary to urinary tract infections, a certain percentage of stones are caused by an imbalance of calcium and phosphorus in the diet. Forage feed, the natural diet for a wild guinea pig, has a higher calcium to phosphorus ratio. Grains have the inverse relationship and contain more phosphorus than calcium. Research has proven that diets that contain an inverse ratio of calcium and phosphorus can cause stones and soft tissue calcifications. The relationship of Vitamin D and magnesium are also contributing factors in this problem." All the above info are from Oxbow's website & more can be found at this page on Oxbow's website. Needless to say, Oxbow's pellets will greatly reduce the chances of your cavies suffering from any of the above mentioned health problems. So if you can afford it, I strongly recommend Oxbow pellets! Here's an example of cavy mixes above on the left, while the one on the right is pellets. I strongly recommend pellets & I use Oxbow Cavy Cuisine. Now there are 2 sub-categories of pellets: alfalfa based & timothy hay based. Timothy pellets are more costly & in S'pore so far the only brand that has timothy pellets is Oxbow. All other brands sell only alfalfa based pellets. 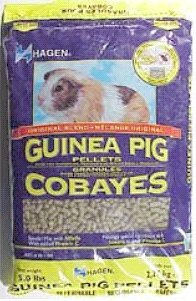 For cavies 8 months & younger, alfalfa pellets are okay. But too much alfalfa can cause problems for older cavies & hence it is recommended to provide timothy pellets instead. As far as cavy pellets are concerned, the recommended minimum fibre content is 25% while the maximum fibre content is 28%. As far as fat goes, most pellets have between 3 to 5% fat which isn't great. Naturally the less fat there is the better. Feeding a high energy, high calcium & high protein diet to an adult cavy can lead to obesity & even death. However growing cavies need more protein for muscle development & more calcium for bone development. Even though timothy based pellets are recommended for cavies 8 months & older, it all depends on your finances since they cost more than alfalfa based ones. However a high fibre, low starch & low fat feed is a definite must, regardless of whether the pellets are alfafa or timothy based. For younger cavies, more calcium & protein. The direct opposite for cavies 8 months & older. So what happens if your cavies are 8 months & older but you can't afford timothy pellets? Well alfalfa pellets are ok but make sure you DO NOT give alfalfa everyday. Alfalfa pellets with timothy, orchard grass or oat hay is fine but alfalfa pellets with alfalfa is a big no no for mature cavies! In fact alfalfa should be used only as a treat. A small handful once a month will do. Some people give only hay, only cavy feed or only vegetables & I discourage this. Your cavy should be given pellets, hay, vegetables & fruits for it be have a well balanced diet. And don't forget an ample supply of clean water. If you're currently feeding mix & wish to change to pellets, do so slowly. The same applies when you're changing from alfalfa pellets to timothy ones. Mix some new feed with the old one. Slowly reduce the amount of old feed while increasing the amount of new ones, until your Cavy is eventually on the new feed. Never change the food suddenly. This applies for hay too. Do not suddenly switch from 1 type of food to another. Do it gradually. A 7 to 10 day transitional period is best regardless of whether you're switching feed or hay. Cavies, unlike rabbits, are unable to manufacture their own vitamin C & hence need food that is vitaminc C enriched. Never feed hamster, rabbit or chinchilla food to your cavies. Always stick to those that are specifically for cavies only. I don't even trust those that say "rabbit & guinea pig". Needless to say I think food labelled "for all small animals" is totally horse crap! First of all, other animals' food may lack certain vitamins or nutrients cavies need. Secondly, some chemicals which are fine for other small animals may be toxic to cavies. If you've emptied an entire packet of cavy food before, you'd notice quite a bit of food dust. These can cause our fuzzy pals to sneeze so you should remove as much as possible. In addition, cavies don't eat food dust & it will block the supply of food from a small food hopper. I scoop a handful of pellets & pour it from hand to hand several times. As I'm doing this, food dust will end up in my hands & I junk them & continue pouring the pellets from hand to hand, until there's no more food dust & its just pellets moving between my hands. Be sure to look at the food while you're scooping it out, just in case there are any foreign objects mixed in there. Lastly, some people ration the amount of pellets given to their cavies & feed them only at certain times. I feel that in most cases this isn't necessary. You can just leave the food hopper or bowl (although I prefer a hopper for hygiene reasons) in the cage & let your cavies eat as & when they want to. It is necessary to ration only if you notice your furball eats non stop & is getting fat. Then it might be time to control their intake, but you should discuss it with an experienced breeder or vet rather than experiment. Most cavies seem to know how to control their intake so leaving the hopper in there at all times should be fine. Always practise "first in first out" when dealing with food be it pellets or mix. The longer the food is exposed to air, the faster the vitamin C will be destroyed. It will also become stale faster & there may even be worms or other insects. Therefore don't just scoop new pellets on top of the old ones. Instead remove the old pellets, pour in new ones & lastly dump the old pellets on top of the old ones. This way your cavies will eat the old pellets first. When you scoop out the old pellets, this is a good time to remove food dust which should be quite plentiful by this time. By doing so, you can also check for worms & other nasties that may have found their way into the hopper or bowl. Many brands of cavy feed be it pellets or mixes contain preservatives. So far the only brands that I know of that DO NOT contain chemical preservatives are Oxbow, Hagen, 8 in 1 & Mazuri. Usually if the feed contains animal fat, animal byproducts or if the feed is a mix, it will contain preservatives. There are many types of preservatives with Ethoxyquin, BHT & BHA being the most commonly used. Kaytee, Hartz and L & M are some brands that definitely contain preservatives, Ethoxyquin to be precise. Certain brands like Brown's & Vitakraft for e.g. do not mention if preservatives are used. However just 'cos Ethoxyquin or BHA isn't reflected in the ingredient list, doesn't mean the feed is preservative free. One reason is a lesser known preservative (e.g. propionic acid) could be used & you may not be familiar with it & may not know it is actually a preservative. Another reason is in certain countries it is not compulsary to include preservatives in the ingredient list. So just 'cos its not reflected on the ingredient list doesn't mean its not used. Only way to confirm is contact the feed's manufacturer. I am not going into a discussion about each type of preservative since I am not an expert in this field. However on the internet there have been several discussions on whether preservatives, especially Ethoxyquin are safe for pets. Ethoxyquin is lethal to humans & even though we are very different from cavies, I often wonder if something lethal to us is lethal to cavies too. If the cavy feed you use contains Ethoxyquin or some other equally "harmful" preservative, I believe you have reason to be concerned. 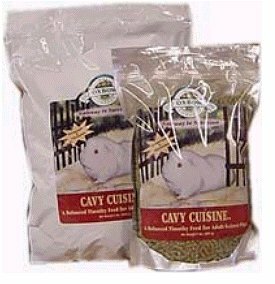 After all your cavies eat the cavy feed daily. Assuming your cavy is 3 year old, it would've eaten 3 years' worth of Ethoxyquin. Is that enough to be harmful? It sure sounds bad! More info about Ethoxyquin on my "Medical" sub-page. I am not about to take any risks which is why I only use Oxbow pellets which are preservative & artificial colouring free. Many more advantages of Oxbow pellets on my "Brands of Cavy Feed" sub-page. Some treats I use do contain preservatives but since treats are only given occasionally, I'm not too worried about them. But even then I make it a point to avoid treats that contain Ethoxyquin. So should you avoid all brands that contain chemical preservatives? Its really very subjective but I recommend you do. As far as possible, try feeding your cavies only items preserved with natural preservatives like vitamin C or E.
Pellets that come in ziplock bags does help but if moisture gets into the bag, the air tight feature of ziplock bags will not help much. Firstly, make sure the pellets are totally dry. If you use hands to scoop pellets, put on gloves. If your pellets don't come in ziplock bags I advise you to transfer the pellets to ziplock bags. A small box doesn't cost that much & can be re-used. Just make sure there are no holes or else its time to replace the bags. Sachets of silica gel can help in absorbing moisture. Just make sure they don't spring a leak & contaminate the pellets. Also, there is a limit to how much moisture they can absorb, so don't expect a sachet to last for a whole year! Oxbow pellets used to come with these sachets so I saved them & still use them. I believe you should be able to buy them from hardware or camera stores too. As long as you try your best to ensure the pellets & ziplock bag are dry, and the ziplock bag is as free of air as possible, the chances of mouldy pellets is quite slim. Okay so your preventive measure didn't work & your pellets have gone mouldy. Upon discovering mouldy pellets, the first thing to do is chuck them out pronto. Mouldy food is the easiest way to kill a cavy! Then make sure you wash the hopper/bowl. Or at the very least give it a good wipe with a damp cloth followed by a dry cloth. Next, check the rest of the pellets you've kept in the bag or container. If they're mouldy, junk them! If not, you can use them but keep an eye on them. If they start turning mouldy too, junk the entire bag of it! So assuming your entire supply of pellets is mouldy & has been junked, obviously you'd need to replenish it. But what if the same type of food isn't available? Well you can try your best & look everywhere but if its really out of stock, then the next best thing to do is get a brand similar to what you used to use. For e.g. if Oxbow Cavy Cuisine isn't available, you could try Oxbow Cavy Performance or if that too isn't available then perhaps Hagen cavy pellets. However you should try to switch back to their old brand as soon as possible. At no time should you continue using the mouldy pellets. That is asking for trouble 'cos your cavies are sure to be sick! I know its a waste to junk a $16 bag of pellets, but isn't that better than having a sick or dead cavy? There is no way of telling whether the pellets are mouldy before you buy them, unless it comes in transparent plastic packs like Kaytee. So if the bag is opaque like Oxbow's, what you could do is give it a shake. Make sure the pellets are loose. If they are clumped together, it means they are damp. And dampness is sure to lead to mould growth.